The number of damaged cells in the raw materials for oil press should be more, which helps to produce oil. The size of the oil materials for pressing should be appropriate. If the size is too large, it is easy to crust and close the oil road, which is not conducive to the oil production. If the size is too small, it is also not conducive to oil processing. In the pressing process, it can take away the fine stuff , increase the oil flow resistance and even block the oil road. At the same time, the fine stuff will increase the plasticity of the oil materials, which is not conducive to the increase of pressure. On the premise of not affecting the internal and external structure, the greater the bulk density of the oil material is the better, which is beneficial to the improvement of the processing quantity of the equipment. The pressing oil material should have proper moisture and good fluidity. The pressing oil material should have the necessary temperature to minimize the oil viscosity and surface tension, so as to ensure the good fluidity of the oil during the whole process of pressing. The pressing oil materials have enough plasticity. The plasticity of the oil raw material must have a certain range. On the one hand, it must not be less than a certain limit to ensure that the oil materials have quite complete plastic deformation. The properties of the pressing oil raw materials include not only the gel part but also the form, quantity and the separation degree of the oil. The factors affecting the pressing oil raw material properties are water content, temperature, protein denaturation and etc. Moisture and temperature for pressing oil. Numerous facts have proved that despite the good control of machine behavior, it is also difficult to produce normal results with bad or unstable moisture and temperature. The moisture and temperature for pressing oil directly affects the physical property and chemical processes of the raw material embryo. The result of theoretical research shows that the material embryo should have proper moisture and temperature, that is, the fluidity of material embryo is good, the viscosity and surface tension of oil should be reduced as far as possible, so that the material embryo has proper plasticity and elasticity, so as to maintain normal pressing chamber pressure. The water content and temperature is usually achieved by the pretreatment process. The practice shows that the use of "hot pressing" in the general situation is obviously better than cold pressing in oil production efficiency and economic benefit. Protein denaturation is essential for extracting oil by pressing. However, the excessive denaturation of the protein can reduce the plasticity of the pressing oil raw material, thereby increasing the "extrusion" pressure of the oil press, which is contrary to the effect of increasing the moisture and temperature. The destruction degree of the colloid structure in the oil materials is measured by the protein denaturation in the pressing materials. We have been committed to the field of high quality oil extraction technology research and development. 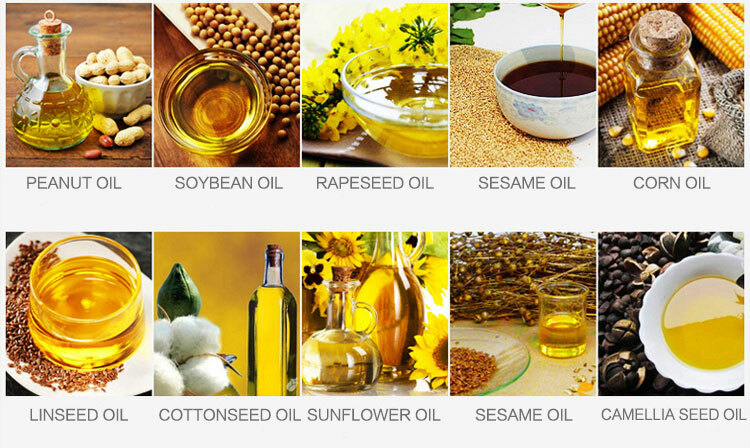 Raw materials for our oil press include sesame, walnut, pine nut, almond, tea seed and other oil crops. 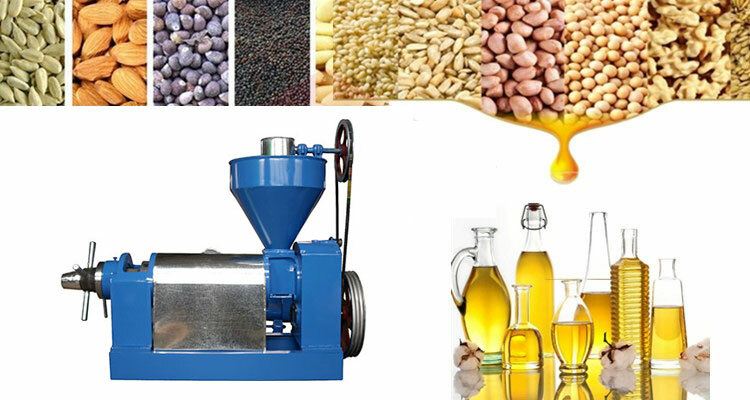 If you have oil crops or raw materials, please contact us for small oil press, large oil press, oil filter press, sunflower seeds oil press, soybean oil press, etc.